If you have an Instant Pot, you need to make this recipe IMMEDIATELY! 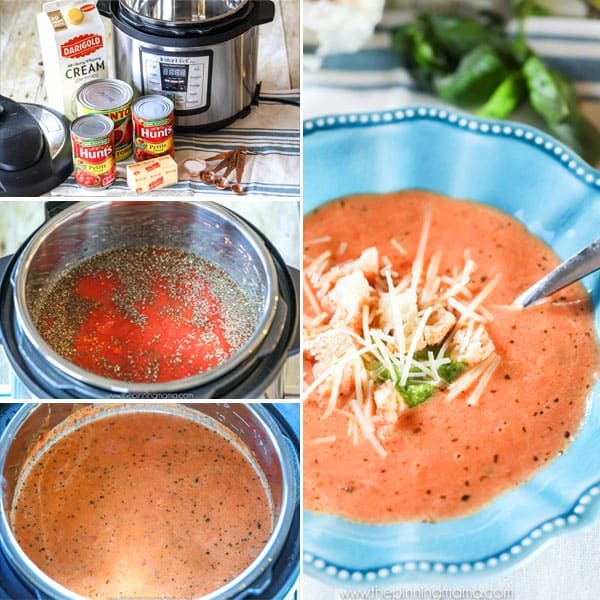 This Creamy Tomato Basil Soup is super simple and can be made super quick with the help of your pressure cooker! This recipe is absolutely my go to in cold weather and makes a wonderful simple lunch or dinner! I am so excited to be posting my first Instant Pot recipe today. I got an Instant Pot several months back and have been playing with it and learning a lot along the way in hopes that I can start sharing more recipes for it here. You might have seen some of the fun on my Instagram Stories since I have been showing you my crazy dinner ideas over there. I even shared a sneak peek of this recipe! Now I want you to prepare yourself because this recipe is pretty amazing. I always get nervous to over promise, so I usually don’t go too over the top, but this recipe is absolutely one of my favorites and since everyone that tries it pretty much says the same thing, I feel pretty confident in saying, STOP WHAT EVER YOU ARE DOING AND MAKE THIS! 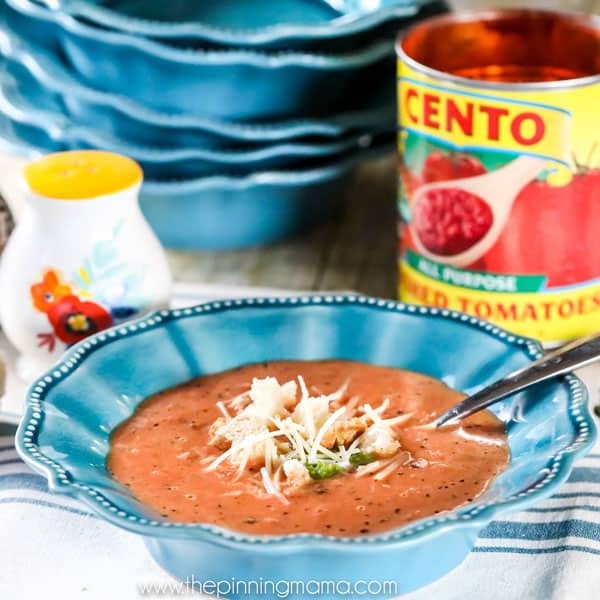 If you love tomato soup I really think you will love it! 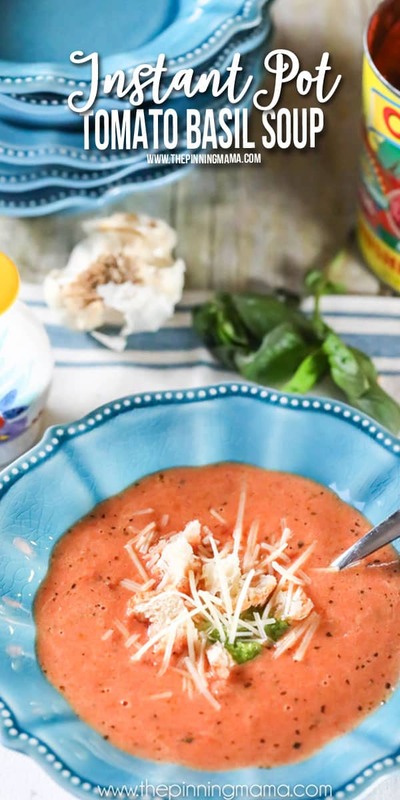 This recipe is adapted from this stovetop creamy tomato basil soup here, which has always been one of my favorites, but I think it might be even better in the Instant Pot! I am going to detail all of my tips below and go through a couple of different options and variations you have in making this soup, but if you just want the recipe feel free to just scroll on down to the bottom to grab it. 1 28 oz can crushed tomatoes– You can use one large can or two small cans. There is a slight volume difference but it won’t affect the outcome. 1 28 oz can diced tomatoes – You can also use 2 small cans here as well. 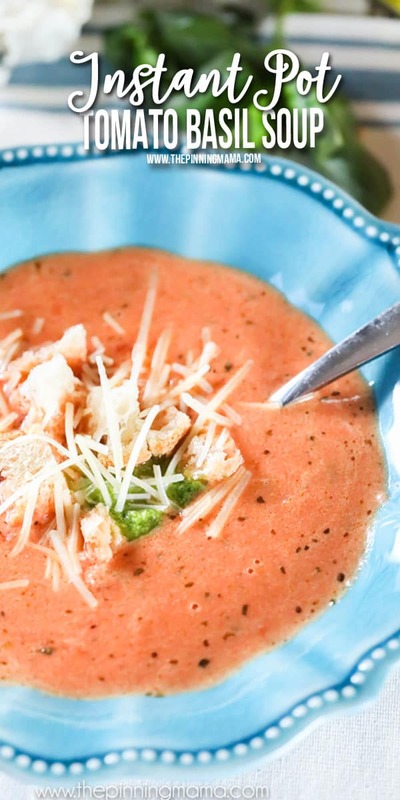 This recipe makes a slightly chunky tomato soup. If you want a smooth tomato soup, use all crushed tomatoes instead of using dices tomatoes here. You can also use an immersion blender to smooth it out if you want to use the diced tomatoes. 1 tbsp crushed garlic- You can usually grab this in the produce section. 1 14 oz can of chicken broth, or 2 cups– You can see how I make chicken broth from left over rotisserie chicken here if you want to make your own. It is so easy! 1/3 cup butter, cut into 1/2″ cubes– The butter adds richness to the soup but really isn’t too much per serving when you dish out the soup. 1 cup heavy cream- You can lighten it up by using half and half. I have done this, but heavy cream really is so much tastier and really only breaks down to about a tablespoon or so per a serving. 15-20 basil leaves -OR- 1 Tbsp dried basil leaves– This soup is super yummy with fresh basil, but it is pretty hard to keep on hand during the winter so I often use dried basil instead. It is still really good with dried, but you make it slightly differently depending on which kind you use, so make sure to keep an eye on the instructions! Pour the tomatoes, broth, and garlic into the Instant Pot bowl. If you are using dried basil, also add it now. Then close the lid and set on Soup mode and reduce the cooking time to 20 minutes. If using a different pressure cooker brand, then set to pressure cook for 20 minutes.The important things to note in this step is that if you are using dried basil you add it here, but if you are using fresh, then you will wait until later. This step will really meld the flavors together. When I set my pot to soup mode it went by default to 30 minutes and I had to reduce it to 20 minutes. Once I had set it the first time it remained on 20 minutes when I selected soup mode as long as I didn’t manually change it. When it is done, release the pressure and stir in the sugar then stir in the butter and stir continuously until melted and well combined.If you are running around like crazy and can’t get to it right away it can sit and will be just fine. Really with this soup this step is just really combing the flavors so you don’t have to worry about anything over cooking if you can’t get there to release the pressure right away.I always like to stir in the sugar first which is super quick, then add the butter, which I chop into cubes just to help it melt faster. You want to stir it until all the butter is melted and combined into the tomato mixture. Next stir continuously while pouring in the heavy cream very slowly. Continue to mix until it is incorporated throughout. If you are using fresh basil stir in the basil now.This step is super easy, but very important to do correctly. You really need to pour the cream slowly and stir it as you pour. If you dump it in all at once it doesn’t mix as well and you won’t get the super pretty creamy red color or have the super smooth texture unless you do it slowly. Serve hot, topped with a dollop of pesto, croutons and a sprinkle of parmesan cheese.This is my favorite way to serve it, but feel free to serve it up with a nice hot grilled cheese, or any other way that you love! It is also especially good with homemade croutons or with a Spinach Artichoke grilled cheese if you are feeling fancy! I truly hope from deep, deep, down in the bottom of my heart that you absolutely love this soup as much as I do and it is everything I promised it would be. If you get a chance to try it, please let me know in the comments. It absolutely makes my day to hear about people who find and are making my recipes. Also, feel free to tag me on Instagram –> @easyfamilyrecipes, or just follow along for all the easy recipes I share each day! Pour the tomatoes, broth, and garlic into the Instant Pot bowl. If you are using dried basil, also add it now. Then close the lid and set on Soup mode and reduce the cooking time to 20 minutes. If using a different pressure cooker brand, then set to pressure cook for 20 minutes. When it is done, release the pressure and stir in the sugar then stir in the butter and stir continuously until melted and well combined. Next stir continuously while pouring in the heavy cream very slowly. Continue to mix until it is incorporated throughout. If you are using fresh basil stir in the basil now. Serve hot, topped with a dollop of pesto, croutons and a sprinkle of parmesan cheese. What a great idea! This is going to be my new favorite comfort food. So delicious and so easy to make. Thank you for sharing! Love how easy this soup looks! This is my bowl of heaven and comfort. Thank you! OK. I’m getting an Instant Pot! This recipe has convinced me! You should totally do it! My friend that is a vegetarian loves that it cooks beans so much faster too! Omg!! So easy so delicious ! Taste like a fancy restaurant dish. Will never eat canned again! Thanks for a very easy, very tasty dish! Thepinningmama Must get an ip category in the recipe section! Looks delicious! I’m planning on making this for a group of folks who have family recieving cancer treatments. How many will this feed? I would say about 4-6 good sized bowls. I hope they love it! I love this soup. I used half and half instead of heavy cream. Thanks so much. This soup is INCREDIBLE! It has been worked into the “regular” rotation because we eat it all of the time. Pretty in a glass jar and given to a friend. Thanks for the recipe! When would you use the immersion blender before or after cooking and adding cream? Will this soup freeze well? Yes this soup freezes beautifully! I made this recipe in tonight and I used my immersion blender after adding the cream, so the very last step. Can you use vegetable stock instead? Oh and greek yogurt to make it slightly healthier? Vegetable stock would be a great subsitution. I have never tried greek yogurt, so I am not really sure how that would work, but I have used Half and Half to lighten it up. It is still yummy but loses a bit of richness and is also a bit thinner. Let me know if you try the yogurt, how it comes out! Made this last night, very good. I added maybe a tsp. of salt and a good amount of fresh cracked black pepper. I didn’t have any cream on hand, but I did have some evaporated milk. Nice and creamy and my kids gobbled it up. I made this yesterday, and it was awesome! It took 20 minutes for my pot to come to pressure, so it was 50 minutes from the time I started gathering ingredients until we were eating. Hi it’s in the pot now, can’t wait to try it. Wondering if you recommend a quick release or natural release? Think I’m gonna do the quick release because, well, it’s quicker… but I’m not experienced enough yet with the pot to know how each release method affects the food. I just do what the recipe says. I haven’t tried using the mini pot yet. I will look into and try to get you a good answer soon but I think the cook time will be the same because it is more for flavor. I decided to just go for it and tried it for lunch a few days ago. I couldn’t find a reg size can of crushed tomatoes so I used 2 cans of diced and put 1 in mini food processor and pulsed to break up. Turned out great! Thanks so much! Hi Dorinda- I have not tried this recipe with onion. It would probably be good, but you would have to blend it at the end with an immersion or counter top blender if you did use the onion. I guess the reason I never have, is just that this recipe is so good, I have never wanted to tweak it. You know if it’s not broke and all… If you give it a try, I would love to hear your thoughts. I made this tonight and I just wanted you to know how excellent this is. I especially love that it used canned tomatoes, so it’s easy to keep the ingredients on hand to make this any time. 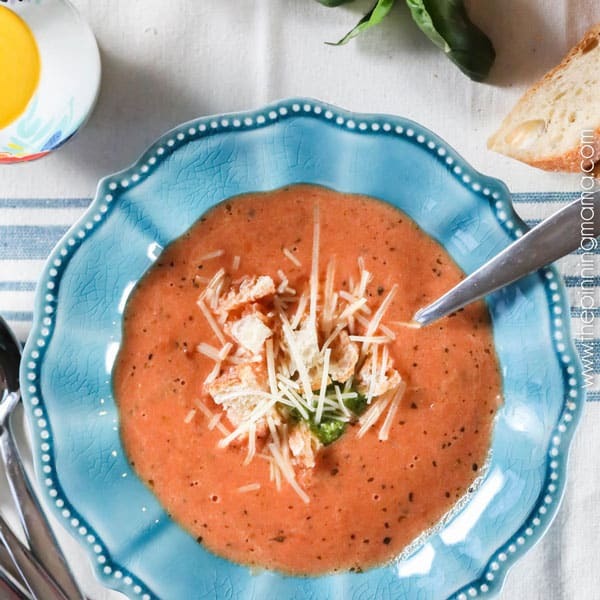 This soup will be going into our regular dinner rotation! This is the best tomato I have ever had. Easy to make. Very good instructions. Quick and easy. It’s a keeper for me. Thank you for sharing.. Sincerely. My Daughter tried it first. She said Mom you have to make this. It’s delucous. Thank You from both of us. This is amazing! I’ve made it several times. I usually half the recipe and keep the time the same. I use an immersion blender at the end to make it a creamy soup. I also mix Parmesan directly into the soup as opposed to topping it with it. It has great flavor! That’s a great idea! I might try blending the parmesan in next time too! Hi! Can this soup be processed and canned? This soup was VERY good! Leaps and bounds better than anything you’d find straight out of a can! I did sub some fresh tomatoes (cause they’re in season and ABUNDANT) and only used one small can of diced tomatoes. Made the recipe, otherwise, as posted and i would definitely make it again in the future! Thanks for sharing such a great recipe! Are you able to freeze this soup? Yes it freezes beautifully! Enjoy! Absolutely delicious! It was quick and easy and perfect with grilled havarti Dill cheese sandwich! I made your recipe tonight and the soup was absolutely amazing!!!!! Definitely going to be keeping this recipe! Thank you so much! I love hearing that! Oh my gosh, this soup is so delicious it is INSANE! 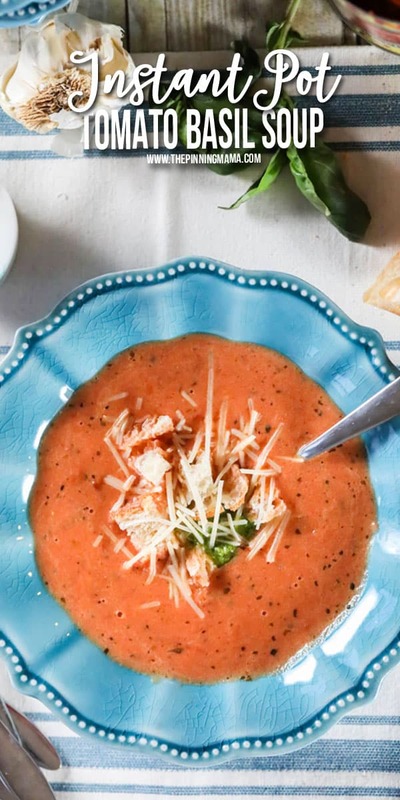 It has to be the best tomato soup I’ve ever had in my life, and I am a bit of a connoisseur of cream soups — especially tomato soup! I made the soup right after returning home from a long walk in the cold — about an hour and a half in sub-freezing temperatures. I ate FOUR one cup servings –literally inhaled them. I wanted to keep the calories low, so I substituted non-fat greek yogurt for the cream — it was superb and if I hadn’t done it myself, I would have sworn it was full fat heavy cream. I also doubled the garlic, because there is no such thing as too much garlic, in my kitchen! I am going to go to sleep dreaming about this soup. Thank you for the recipe! I received a mini ip for my birthday recently and I found your tomato soup recipe.. May I say, it was outstanding. I did tweak it though, I added finally chopped onions along with the garlic. I also added the parm when it was time to add the fresh basil and cream…half & half, though. I left out the butter.. My husband had a heart attack this past Oct. hence, the eliminatation. Regardless, it was, as I mentioned, OUTSTANDING! I highly recommend this recipe but keep the ip size in mind. This is now saved for future enjoyment. Does everyone use an immersion blender for this recipe? I have a small 3OZ Instant Pot, so I halved the recipe and unfortunately it burnt. Do you have any suggestions?